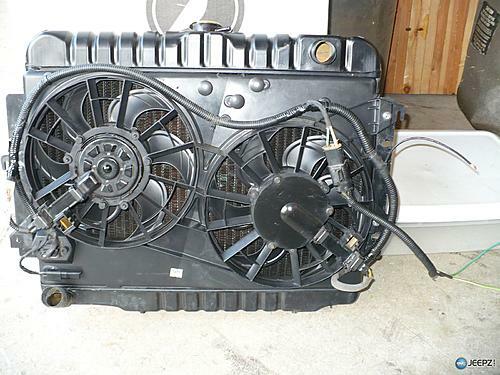 *which* year/model ford taurus fan did you use in your jeep? Thread: *which* year/model ford taurus fan did you use in your jeep? I want to do the ford taurus electric fan mod, but i want to make sure i get the right one. I have a dual-fan from a taurus, but unsure if it will fit (will be trying out tomorrow). Otherwise, what have you all used? I have never seen a dual fan in your pics so I think i need to get a different kind. Re: *which* year/model ford taurus fan did you use in your jeep? Mid 90's from the 3.8L engine. It's a single fan with 3 wires. On my '78 CJ5 (V I used the '98 Ford Coutour/Merc Mystique dual fan it it was practically a perfect fit. In the process I heard from some that mentioned the twin fans had a higher flow rate, but I don't know about that, but it has the same three wire hookup, unless you get elaborate about relays and soforth. Last edited by Turbogus; 02-25-2018 at 05:38 PM. Good pic, but 6yr old post. I grabbed mine from a liberty. Then grabbed a wiring harness that goes to the fuse block and then relayed it in the block using an unused port and tied it into the temp sensor. Don't have to have to do anything for a total of 100 bucks in parts using a used fan from an 03 liberty. What's your favorite model and year Jeep? '03 model year TJ factory order?? ?